BTC’s Take: The definitive study of Grant’s Fifth Offensive against Petersburg gets an update and face lift for the 150th anniversary of the Siege of Petersburg. Dr. Sommers has forgotten more about the Siege of Petersburg than most of us know. The first edition of Richmond Redeemed was based on Dr. Sommers’ PhD. thesis, which is even larger than both versions of this large book. In addition to the usual hardcover and Kindle editions, Savas Beatie has also produced an enhanced E-Book edition with additional notes and comments by the author. 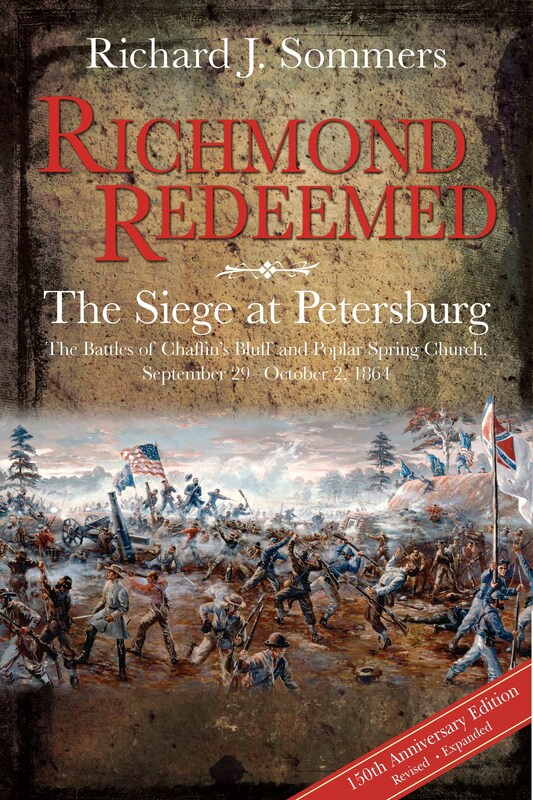 Despite its title, the book does not cover the entire Siege of Petersburg. Instead, its main focus is on the Battle of Chaffin’s Bluff, including the Battle of New Market Heights and the Battle of Fort Harrison; as well as the Battle of Peebles’ Farm. The Darbytown Road battles which followed Fort Harrison are not covered in the same detail as the earlier battles of the Fifth Offensive. However, be sure to check out Hampton Newsome’s book Richmond Must Fall. Newsome made a conscious effort to pick up where Sommers left off, making these ideal companion volumes spanning the Fifth and Sixth Offensives. I wish all of the offensives had a book of this detail written about them. If you want detailed tactical battle history, this book is for you, and it is proof that you can find detail on the Siege of Petersburg as a researcher if you’re willing to do the work. If you buy only one book on a portion of the Siege, this is the one to get. This monumental study focuses on Grant’s Fifth Offensive (September 29 – October 2, 1864), primarily the Battles of Chaffin’s Bluff (Fort Harrison) and Poplar Spring Church (Peebles’ Farm). The Union attack north of the James River at Chaffin’s Bluff broke through Richmond’s defenses and gave Federals their greatest opportunity to capture the Confederate capital. The corresponding fighting outside Petersburg at Poplar Spring Church so threatened Southern supply lines that General Lee considered abandoning his Petersburg rail center six months before actually doing so. Yet hard fighting and skillful generalship saved both cities. This book provides thrilling narrative of opportunities gained and lost, of courageous attack and desperate defense, of incredible bravery by Union and Confederate soldiers from 28 states, Maine to Texas. Fierce fighting by four Black brigades earned their soldiers thirteen Medals of Honor and marked Chaffin’s Bluff as the biggest, bloodiest battle for Blacks in the whole Civil War. In addition to his focused tactical lens, Dr. Sommers offers rich analysis of the generalship of Ulysses S. Grant, Robert E. Lee, and their senior subordinates, Benjamin Butler, George G. Meade, Richard S. Ewell, and A. P. Hill. Complete with maps, photos, a full bibliography, and index, Richmond Redeemed is modeled for a new generation of readers, enthusiasts, and Civil War buffs and scholars, all of whom will welcome and benefit from exploring how, 150 years ago, Richmond was redeemed.